Once you have your fill of the quiet temples, magical forests, and delicious sushi of Kyoto, hop on the Shinkansen for a few days in Tokyo. Buy a Japan Rail pass your trip, and you won’t regret it; the process is a little complicated but definitely worthwhile. Purchase an exchange order outside of Japan, and turn that in to obtain the official rail pass at a designated station once you arrive in Japan. Passes are valid for 1 to 3 weeks in either regular or first (green) class, and the only catch is that the pass permits travel only on the slightly slower bullet trains (usually Hikari) not the fastest trains (Nozomi and Mizuho). Also, while the pass is obviously a great deal for traveling from city, it is also valid on local JR train lines. We were able to train around both Kyoto and Tokyo for no additional charge. Make your first stop in Tokyo the storied Park Hyatt Tokyo, which was, among other things, the setting for Sofia Coppola’s Lost in Translation. If you have the chance, do what you can to stay at this absolutely spectacular hotel, which sits atop an office-filled skyscraper. The hotel portion of the building begins at the 41st floor and tops off with the New York Bar on the 52nd floor, ensuring that you will have a magnificent view of the city. If you have Hyatt Diamond status, all the better. As a Diamond member, you will receive some incredible concoction from the hotel’s pastry boutique upon checkin, complimentary breakfast each morning (more on that soon), and an invitation to a nightly happy hour at the New York Bar. Breakfast is an elaborate affair any way you choose to take it, and you do have options. A traditional Japanese breakfast is served at Kozue, an excellent choice for guests with no food restrictions (gluten-free eaters will have very limited options). The French bistro Girandole, however, serves an extensive buffet that will more than satiate any gluten-free appetite. 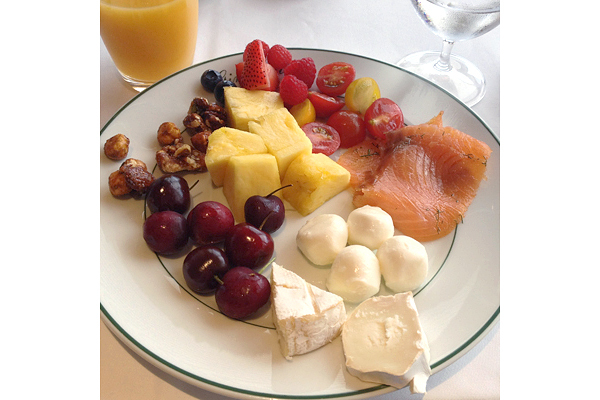 On the two mornings that we visited Girandole, the buffet included at least a half-dozen fresh fruit selections, just as many cheeses, and plenty of smoked salmon and cold cuts. The hot dishes, which were generally potatoes or vegetables, were hit or miss as far as a gluten-free status, but guests are always able to order an egg dish to supplement the buffet. 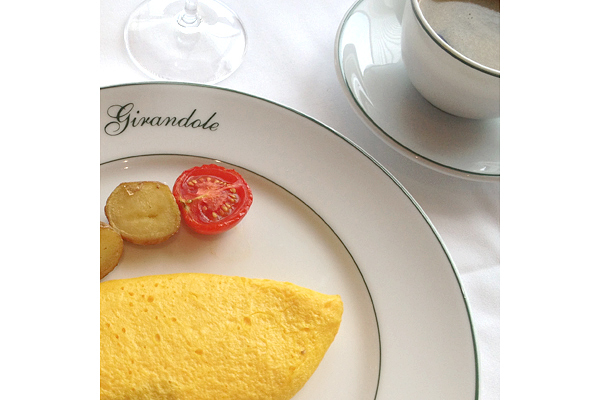 Girandole’s omelets are divine; if you prefer your eggs on the firmer side, be sure to specify, as the cook’s tendency is on the soft side. 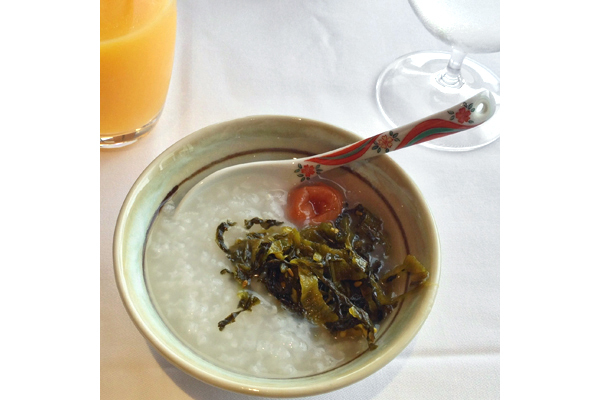 And don’t miss the okayu (rice porridge), topped with umeboshi, to add a Japanese accent to your breakfast. 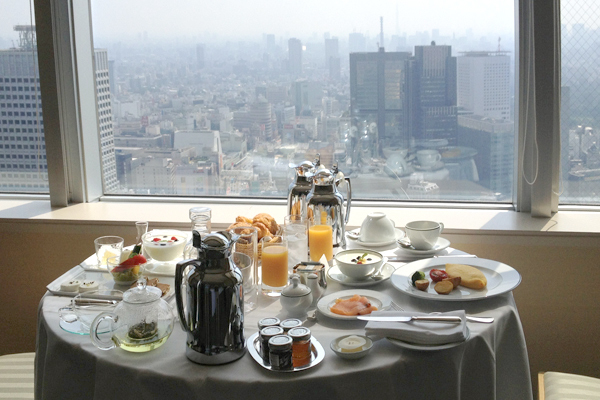 Wherever you take your breakfast, you’ll have a gorgeous view of sprawling Tokyo. If you prefer a more private view with your breakfast experience, room service is of course the way to go. The American Breakfast, which comes with eggs, meat, juice, and coffee, is a great standard gluten-free breakfast, as long no pastry basket is stipulated (or shared with your non-gluten-free dining partner). I found the Healthy Breakfast to be the best gluten-free breakfast option. You can’t go wrong with green tea, a smoothie, raw veggies with an avocado dipping sauce, goat cheese, and Hokkaido yogurt with fruit. 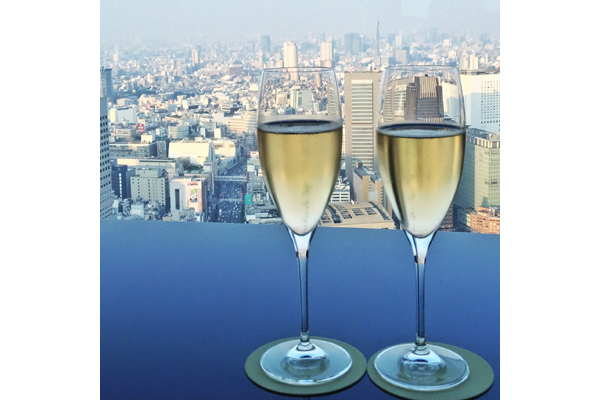 With such amazing food options in the morning and drink options in the evening, you might find it difficult to leave the Park Hyatt Tokyo. But be sure that you do! The hotel’s shuttle will drive you to nearby Shinjuku Station, after the driver apologizes several times for keeping you waiting though you were not inconvenienced at all, where you may or may not find yourself lost for hours in the station’s multiple department stores, sushi counters, and surrounding tiny streets. 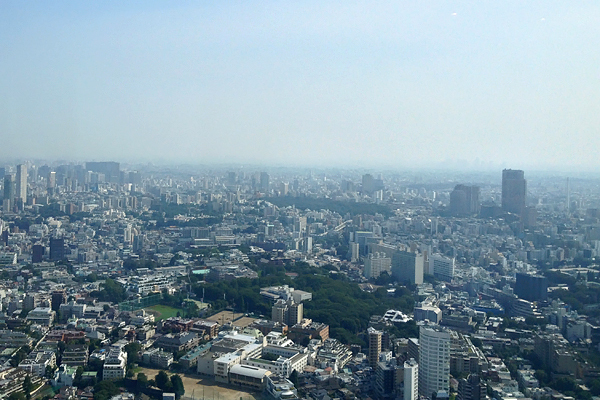 More on tips for exploring Tokyo tomorrow! Where? Girandole and the Park Hyatt Tokyo are located near Shinjuku: 3-7-1-2 Nishi Shinjuku, Tokyo (+81-3-5323-3459).